Move along. Nothing to see here. A day that promised so much ended with Brentford having the candles blown off their own celebration cake by a Barnsley team who took their chances in a gritty game. As the Bees celebrated their 4,000th league game with the commemorative flags handed out to supporters, it was the away side who ended the day celebrating a first league win in 7(seven) games. “It’s just like watching Brazil” sang the visitors. “I just can’t get no relief” sang the half time guest of honour, Annelies. That, of course, during her Queen number rather than being any form of match analysis. Annelies serenades Buzzette. Or is that vice-versa? 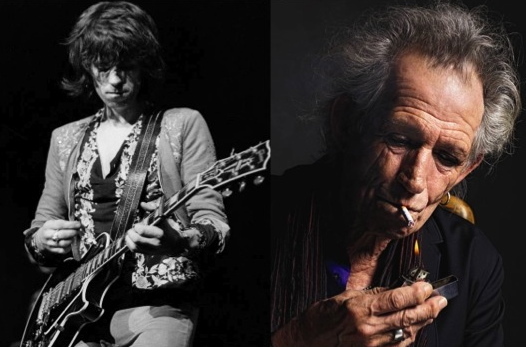 Indeed, half time was about as good as it got. Peter Gilham was on hand to introduce Ben Summers, whose winning competition entry had been selected to be the cover for the programme. However, if Ben was expecting the keys to Griffin Park he was to be sadly disappointed. “We’d like to say you’ve won a thousand pounds but you haven’t. Just a signed copy of the programme” announced Peter in his usual, avuncular style. That said, Ben did have the honour of posing for a photograph with the protagonists in that other fan favourite – the half time mascot race. This, an event not seen since Scummy Bunny and Sonic the hedgehog were amongst those to grace the Griffin Park playing surface back in our League One (or was it two?) days. 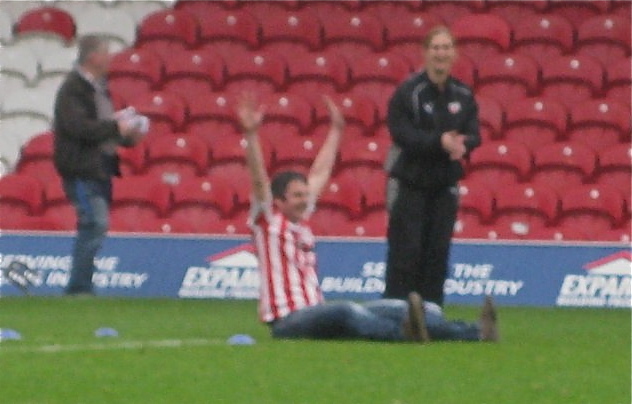 This time around it was a three way shoot out between Buzz, Buzzette and the Barnsley mascot. I’m not sure if this was Toby the Tyke or, as one New Road observer noted, Macroencephablitisbrain the bear. As for the game itself? I can’t talk about it. The BBC, Beesotted or ‘Official’ are your best hopes if any sort of match report is required. Likewise, the video highlights are already up on Sky, if anybody can draw highlights from yesterday’s game. That said, two points of note to take away. Firstly, cheering the substitution of Romaine Sayers for Philipp Hofmann. Seriously? One can only hope this was due to the German’s popularity although I suspect not given the criticism the former Walsall man has come in for from certain quarters. Without wanting to get overly preachy, that’s really poor form and hardly going to help a player who would still seem to be settling into Championship life. Secondly, Dean Smith’s post match interview which contained the pearler. “If we’d taken our chances it might have been a different story.” Hmm. That is, generally, how football works. Instead, the interviews are probably best confined to those conducted by Sean Ridley with the return of Terrace Talk. That aside, it simply remains to offer congratulations to Barnsley for a job well done. As for Brentford, there’s the small matter of a trip to Loftus Road on Friday. I’m going, again. See you there. Brentford play Preston North End on Saturday and it seems that, in the build up to the game at least, there are plenty of changes at Griffin Park. In what seems to be partly a response to the recent ‘match day experience survey’, the eagle eyed amongst you would have spotted all manner of new things in place for the weekend. First up, the Braemar Road forecourt rebrand is now complete. 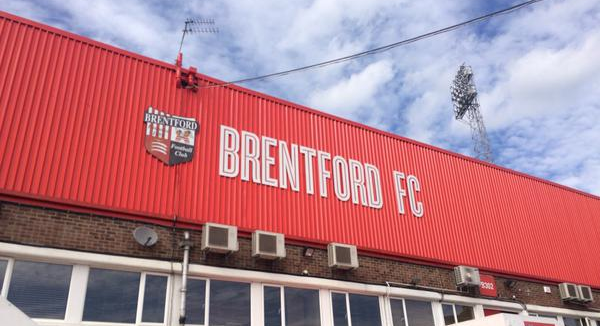 The BRENTFORD FC Stingray font is gone and the new lettering is in place on the repainted main stand. Along, thankfully, with a club badge. We’d had our suspicions as to how this was going to look during the week after chief executive Mark Devlin noted on twitter that, ”You won’t be surprised to learn that it will be in keeping with the new brand guidelines”. Whilst a phrase such as ‘new brand guidelines’ is normally one that strikes the same feeling of doom as “rail replacement bus service” or “Coming up next on BBC one, the Eastenders omnibus”, I have to say that this really bucks the trend. Well done Brentford. The club has come up with a smart, new look. Certainly, much better than the somewhat dated, quasi-futuristic Stingray lettering that had aged as badly as Keith Richards. Whilst the stripes I had thought might also return are still absent from the paintwork, the all red look is still a great one. 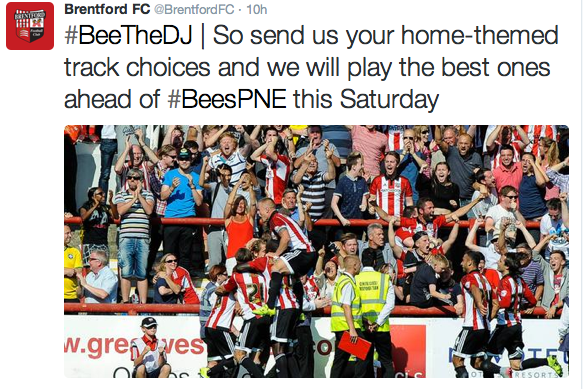 As for the Preston game itself, first up is your chance to play DJ. The club has started to ask fans what music they would like to hear on Big B Radio. (This is assuming people can hear it – I note, also, they are currently asking for feedback on the new PA system). However, it’s something I’ve written about many times before. There’s no excuse for Barry Manilow at football – unless it’s Bermuda triangle (I don’t mean the defence) and, whilst I fully appreciate you are never going to please everybody, this is still a great way to try. And, read this next bit carefully…. We have a hashtag that actually seems fit for purpose. ‪#BeeTheDJ does what it says whilst adding a nice bit of punnery. After the debacles of #trophyfriends and #bignewambitions (which, thankfully, appears to have been quietly shuffled off) another sign that the club do listen. But wait. Like an advert for cheap kitchen knives, there’s more. Centre Circle Challenge is back. Kind of. I loved this event in the past. A home and away supporter would demonstrate who had the least bad kicking skills as they attempted to hoof the football as close as possible to the spot in the middle of the meridian line. All, of course, accompanied by the wonderful commentary skills of Peter Gilham – woebetide anybody with two left feet. After an absence of a few seasons, this has been rebranded and now returns as ‘Bees Bowls’. From reading the blurb on the clubsite (and you can also apply to participate) the end goal appears the same – closest to the centre spot wins.As somebody who has formerly taken part in CCC with mixed fortunes – both reaching the centre spot aswell as falling flat on my backside in the tipping rain – I can only recommend this as being a great fan activity and would encourage supporters to give it a go. Apart from being tremendous fun, it’s not often the Brentford family get a chance to grace the Griffin Park surface. Brentford were held to a 0-0 draw by visiting Sheffield Wednesday – our second in three days – following the trip to Wigan Athletic. It was a game that, on the occasion of our 125th anniversary, promised much but ultimately failed to deliver a goal or three points. “There must be a second goal, just had the pizza email”. Not my words but those of Tim Griffiths, Woking FC’s ‘man with the mic’, who also happens to be a Brentford fan. It was a statement made just after George Saville had, indeed, put the Bees two up against Bradford City and, for the record, was made via text message rather than over the tannoy at Woking’s Kingfield ground. I can only imagine that ‘Papa John’ is blissfully unaware of the spin-off benefits to displaced football fans resulting from his two-goal pizza deal. Whilst it may not have the finesse of the videprinter, that confirmation that you are now entitled to cheap pizza (should you so desire – I’m more a post match curry man) is a sure fire sign that your team are only five goals away from brackets (seven). Don’t do it Buzzette – when mascots lose their head. It would be fair to say that Brentford mascots Buzz Bee and Buzzette are two of the better behaved in the football world . From Wolves to Wolfsburg and Dunfermline to Swansea, the age-old matter of mascots getting ‘carried away’ was brought to the fore again at the weekend. You’ve probably seen the video clip sweeping the Internet from Sunday’s Bundesliga encounter between 1899 Hoffenheim and Vfl Wolfsburg. The game has since attracted the public interest – less for the 8 goals and more for the ‘accident’ that befell the home team’s mascot, Hoffi the Moose, as they notched their fourth goal of a 6-2 win. Rushing to celebrate with the players on the pitch, rather than leap the barriers Hoffi managed to trip over them and, quite literally, lost his head . For those who’ve had theirs buried in the footballing sand – which is almost where Hoffi ended up – you can see the incident here. Seeing this has put my in mind of some of the more infamous mascot moments. Whilst the downside of the next clip means you need to sit through a few seconds of Angus Deayton, stick with it. It’s the moment where Brentford’s League one rivals Wolves, saw their ‘Wolfie’ take on all three of Bristol City’s ‘little pigs’ single-handed. 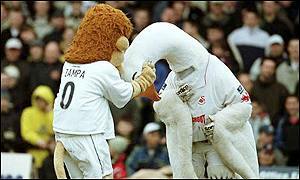 Sadly (for research purposes), I’ve been unable to unearth any footage of Swansea’s ‘Cyril the Swan’ who, amongst other misdemeanours, once performed a pitch invasion that culminated in his ripping the head off Millwall’s Zampa the Lion. Cyril then proceeded to drop kick it into the crowd. That said, you can still read the original BBC report (check out the ‘old school’ internet) here. However, my particular ‘lowlight’ of mascot mayhem is, almost certainly, Dunfermline’s Sammy the Tammy. Back in April 2011, he took to the field in a derby game with local rivals Raith Rovers in a home made tank before marching to the half way line and appearing to take pot shots at the opposition fans. All this accompanied by the subtle soundtrack of ‘Two Tribes’ (go to war)., by pop music’s Frankie Goes to Hollywood. The moment has been recorded for posterity, with Tammy losing his head (metaphorically rather than literally) about three minutes in. Whilst there is nothing positive to be said about football violence, there is something mildly amusing about a punch up between a six foot anthromphised Wolf and some equally weighted piglets. However, even I would draw the line at Buzz Bee, in a home-made Sherman, taking aim at the Fulham fans next season.